Not spending enough quality time with your Panini maker? 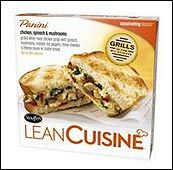 Thanks to Lean Cuisine, that doesn't mean you have to live a Panini-free life! The famous diet-friendly frozen food makers have launched a line of crispy, cheesy Paninis that promise to grill to a golden brown, in the cozy confines of your microwave. There are FOUR different kinds, and each has under 300 calories. Varieties include a Chicken, Spinach & Mushroom on Italian bread, as well as a Chicken Club, a Steak, Cheddar & Mushroom, and a Southwest Style Chicken, all of which come on Sourdough bread. Panini-licious! Listen up! If you're a calorie or points counter that likes to frequent fast food joints, you may need to re-think how many calories or points you're actually consuming. 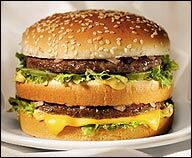 A recent British study found that items purchased at McDonald's, Burger King, KFC and Pizza Hut contained significantly more calories than their company web sites reported. The problem wasn't due to inaccurate nutritional testing, but lied rather with oversized portions. Consider yourself warned. Ginormous portions = ginormous calorie counts. There are lots of uses for that iPod of yours, but did you know it can now be your new weight loss buddy? TriMP3 is a new web site offering up motivational mp3s that download right to your iPod or personal mp3 player. Just download one of the hypnosis, motivational, or relaxation files, listen to it for 14 days, and the site's creators say "you will begin to notice positive, healthy changes in your attitudes, beliefs, and behavior." The price? You can get started for under ten bucks (that's less than the cost of most lunches these days!). Lindt Chocolate has debuted a super chocolate bar that's 99% cocoa and so strong that it comes with a warning on the label, as well as instructions on how to eat it. Instructions?! ***Coming up soon from Coke is a soft drink called Coca-Cola Blak. The new beverage will be a coffee-infused "mid-calorie" drink, and launch in France before it makes its way to the U.S. ***Heads up, Girl Scout Cookie-lovers. The new trans fat free version of Thin Mints will contain more sugar and more saturated fat than the old ones, prompting some experts to say that, overall, they'll be worse for you than the originals. That's all we've got. HG out! Today, December 12th, is National Ambrosia Day. Here's a quick 'n easy recipe for low cal, lowfat ambrosia. Share this news with everyone...Click "send to a friend" NOW!